(CNN) -- Forget lawn mowers. Maryland officials have found a natural way to combat brush while protecting a threatened species. Maryland officials wanted an eco-friendly solution that wouldn't hurt the area's bog turtles. Forty bearded goats have been dispatched by the State Highway Administration to control plant growth in the area. They have been munching in an enclosed area for a week; they will stay until September, but will be put back to work next spring. The project is part of Maryland Gov. Martin O'Malley's "Smart, Green and Growing" legislative package, aimed at reducing the state's greenhouse gas emissions 25 percent by 2020. The pilot program will be evaluated at the end of two years, and officials will determine whether to send goats to other grazing projects on state highways, according to David Buck, a spokesman for the highway administration. The goats are reducing the state's carbon footprint and protecting the area's bog turtles, listed as threatened. In addition, he said, the animals are much cheaper than a mowing program: State costs are about $10,000 for two years, most of that for delivery and veterinary services. But the decision to utilize goats was not an easy one. Other herbivorous (plant-eating) animals were considered. 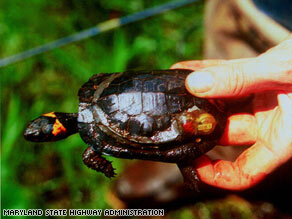 Cows were ruled out because they are too heavy, and their hooves could stomp the small, colorful-shelled bog turtles. Sheep? Well, they just aren't goats. "Goats were just a viable solution," Buck said. "They do not eat moving things. They will not crush [the turtles] out there." Maryland is not the first to launch such an initiative. Officials in Hempstead, New York, bought natural grass cutters for a 50-acre park and preserve this year, said Mike Deery, town spokesman. The goats -- Sleepy, Sneezy, Bashful, Happy and Doc -- were named after dwarves in the fairy tale "Snow White and the Seven Dwarfs." In Vail, Colorado, officials have introduced 500 weed-eating goats in public areas after residents asked for an alternative to pesticides and chemicals. The initiative costs the town about $500 a day, the National League of Cities said. In Denver, signs touting "Goats at Work" alert passers-by to the animals' presence on vacant lots managed by the park system. The goats cost the city about $200 an acre, according to the National League of Cities. Environmental activists hail the measure, calling it innovative and worth implementing. "Most times you can replace small engines that are sources of greenhouse gases with more natural systems, that's a good thing," said Bill Brower of GlobalGiving, a Washington nonprofit organization that describes itself as an online marketplace of grass-roots green projects.